Consultative Process for the Draft Interim Standards for New Directions. New Directions – Personal Support Services for People with Disabilities was published by the HSE in 2012. This document sets out the future vision for the provision of day services to people with Intellectual Disability, Physical and Sensory Disabilities and Autism that have a requirement for a HSE funded day service. You are invited to attend an Information Session which will give details of the Draft Interim Standards that have been developed to support the delivery of the personal support services for people with disabilities contained in New Directions. These Information Sessions will launch the Consultative Process in relation to the Draft Interim Standards and following from these sessions you will have 1 month to make a submission on any aspects of the Draft Interim Standards. The information session details are set out in the attached booking form. 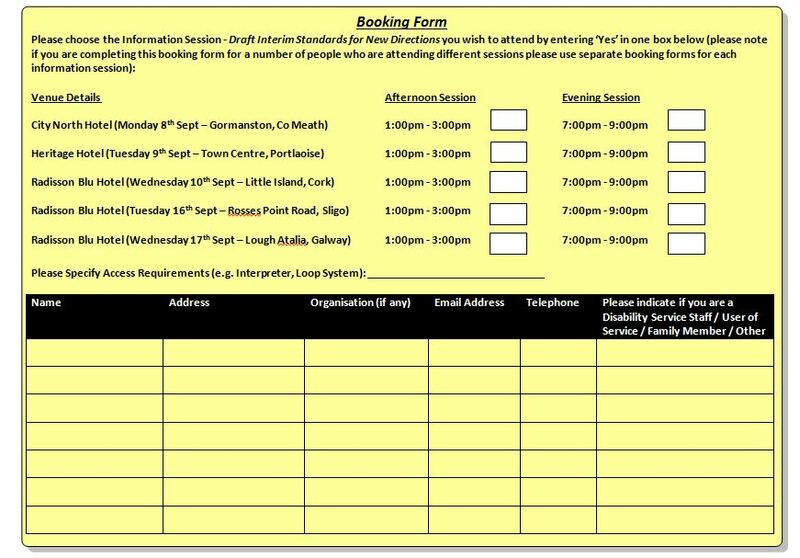 To book a place at one of these sessions, please complete the Booking Form and email to sandra.cogan@hse.ie or send to Sandra Cogan, HSE Disability Services, Bective Street, Kells, Co. Meath before 27th August 2014.